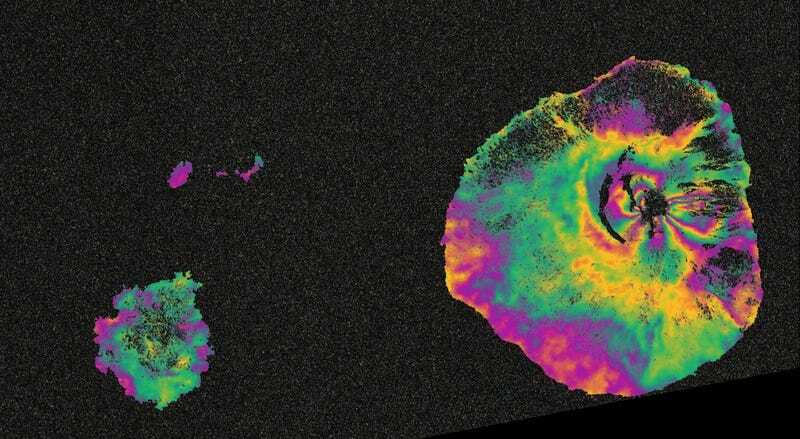 This radar scan, taken by the European Space Agency's Sentinel-1A satellite, reveals the ground movements surrounding the Fogo volcano before and after its recent eruption. To expert eyes, the image reveals the subsurface pathways of molten rock. Located on Cape Verde's Fogo Island, the volcano erupted on November 23rd for the first time in 19 years and has been active ever since. Lava flows are threatening nearby villages, and local residents have been evacuated. The two radar images, one taken on November 3rd (left) and the other taken on November 27th (right) show ground deformations that cause changes in radar signals that appear as rainbow-colored patterns. Scientists can use the deformation patterns to understand the subsurface pathways of magma moving towards the surface. In this case, the radar shows that the molten rock traveled along a crack more than half-a-mile wide. "By acquiring regular images from Sentinel-1, we will be able to monitor magma movement in the subsurface, even before eruptions take place, and use the data to provide warnings," says Tim Wright from the University of Leeds and director of the UK Natural Environment Research Council's Centre for the Observation and Modeling of Earthquakes, Volcanoes and Tectonics. This is particularly valuable in places with few sensors on the ground. In the U.S., for instance, several active volcanoes lack adequate onsite monitoring equipment, due to budget shortfalls. Why Aren&apos;t We Fully Monitoring These Active Volcanoes in the U.S.?